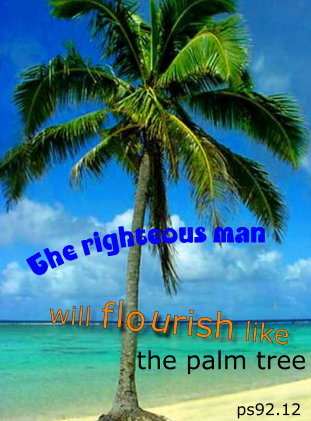 the righteous will flourish like the palm tree. But the real" flourishment" was Jacob....at the end!!!! Isaac....like the palm trunk...kept getting his flourishment nicked. his wells were continually stopped. Haven't we been there!!!!! All the while we think we are building the house....God is building it. He has a flourishment plan!!!! David went through so many phases to get to the point when he wanted to build the Lord a House, and announced it to Nathan. Nathan phoned that evening to say.....errrrr David....about that house.....you are not going to build it. God is going to BUILD FOR YOU an enduring HOUSE.